As promised, following my Cook The Farm Recap: Part I, here’s Part II which highlights Wine Week, visits to Siracusa, Cefalu, Castelbuono and our final week-long tour of Sicily. Similar to Part I, I've opted to bullet a number of stories, quotes and thoughts woven between some of the photos I took. It's neither chronological, nor an exhaustive list of everything I learned, saw, experienced. Feel free to hop around and read or view what you choose. The photos below are from a weekend in Siracusa. 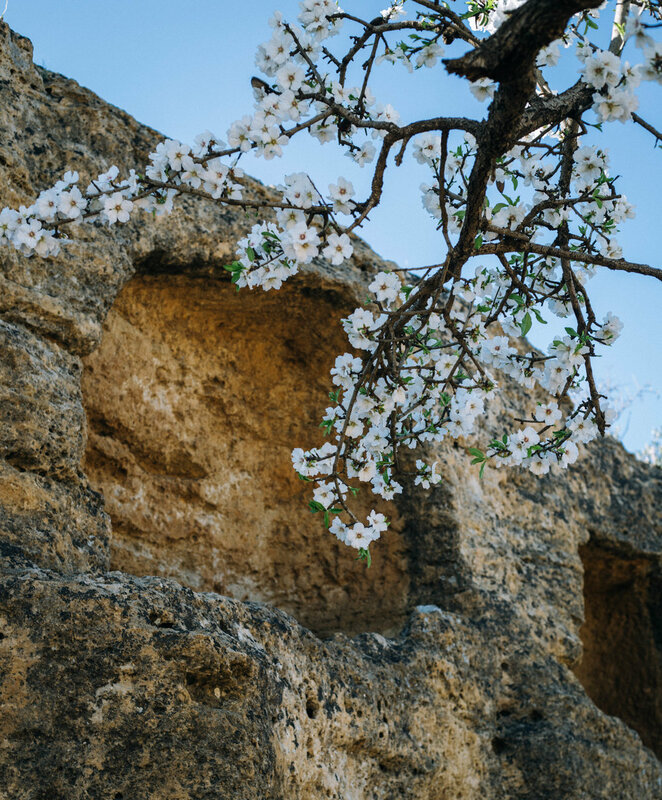 We stayed on the tiny island of Oritigia, which is the historical center of Siracusa, and one of the most beautiful cities in Sicily. Wine Week at the school was FULL of inspirational speakers and tastings. The week started out with a presentation on pruning grape vines, and I didn't expect it, but this turned out to be not only informative and memorable, but also fascinating. Pruning can really make or a break a wine! In my wine studies, pruning was never presented in a particularly exciting way. I've read about the various methods, seen the diagrams, but it never meant much to me. Now, I will never look at grape vines again the same way. Livio Tognon was our pruning presenter; he's part of the Simonit & Sirch pruning team that works with vineyards around Italy, and across the globe, to train pruners and work against the deterioration of vineyards. The lecture and tasting that changed my perspective on how I want to taste and talk about wine was taught by Sandro Sangiorgi, essayist, author, sommelier, a founding member of Slow Food, and impressionable personality of Italian gastronomic literature over the last three decades. The wines we focused on with Sandro all fell under the category of natural wine. Many standardized tastings and exams are built around conventional wine, so we were challenged to analyze wines a bit differently. Sandro had so many fantastic, deeply romantic quotes, a few of which I've written below. Unfortunately, I don't have any photos of Sandro. Just his words. "Wine is life, so it’s hard to bottle something that’s alive. It’s unpredictable." "When the life of a barrel is divided into the bottles, then there are many lives. Like a mosaic, it looks like one thing until you approach it and see it has many pieces." "To taste a wine is always a trip inside of yourself." "When we say a wine has changed over a 30-minute period, have you thought about how much WE are changing in 30 minutes?" "A good wine should make you feel good." "'We do not inherit the land from our ancestors; we borrow it from our children.' I love this phrase by Saint-Exupery. He has always guided me in my work as winemaker." "There is no recipe to tell you how to practice agriculture. You have to take in all the information and make your own decision." "The grape is the tool to express terroir. It is not the goal." "To be concentrated, you need some empty moments to think." Below is a series of photos from in and around the town of Castelbuono, which lies within the Madonie park. 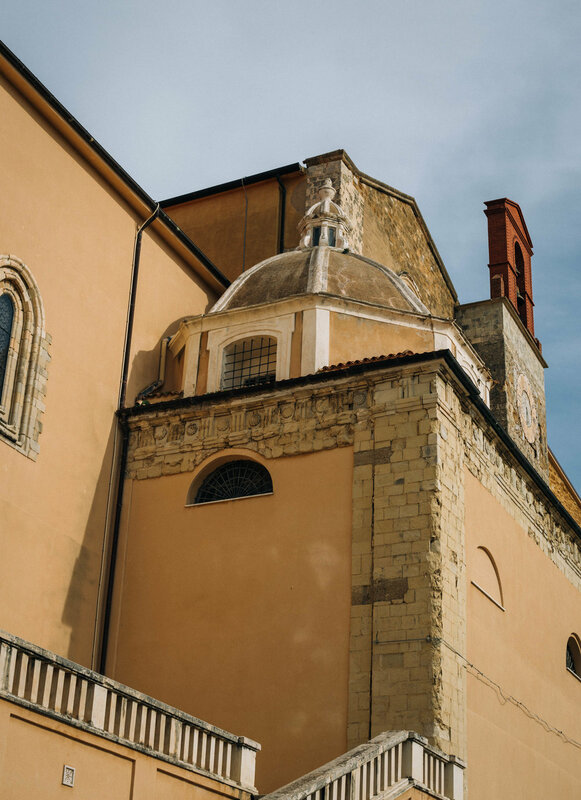 Castelbuono translates to "good castle," and references an Arab-Norman castle in the historic center. Just outside the city, the mountains are speckled with ash trees from which manna is harvested. Manna is a sweet sap tasting vaguely of maple syrup that can only be found in this region of Sicily. We got to see a demonstration of the manna harvest, and taste the final product. To me, manna tastes like a piece of maple sugar fell into a bottle of flowery perfume. It's tasty when used in small quantities! Our last lecturer of Cook The Farm was Chef Pino Cuttaia. Pino is from a city in Sicily called Licata, and opened a restaurant there called La Madia in 2000 with his wife. He received his first Michelin star in 2006, and his second in 2009. As a young adult, Pino worked in a factory in Northern Italy for a while, but always felt drawn to the kitchen. He told us, "One morning, I was standing in front of an onion, and realized I could choose to cut it any way I wanted. It made me feel free, and freedom was my calling." Pino's philosophy of cooking is based in simplicity and elegance, and I've already recreated some of the dishes he demonstrated for us that afternoon. "The maximum communication that happens when you pass someone on the street is 'Hello,' but food can open up a much more interesting conversation and story." "A big part of enjoyment of food is the element of surprise." "If you find something that gives you a sense of freedom, you’ve found something you love." And finally (FINALLY! ), photos of our week-long trip around Sicily are below! 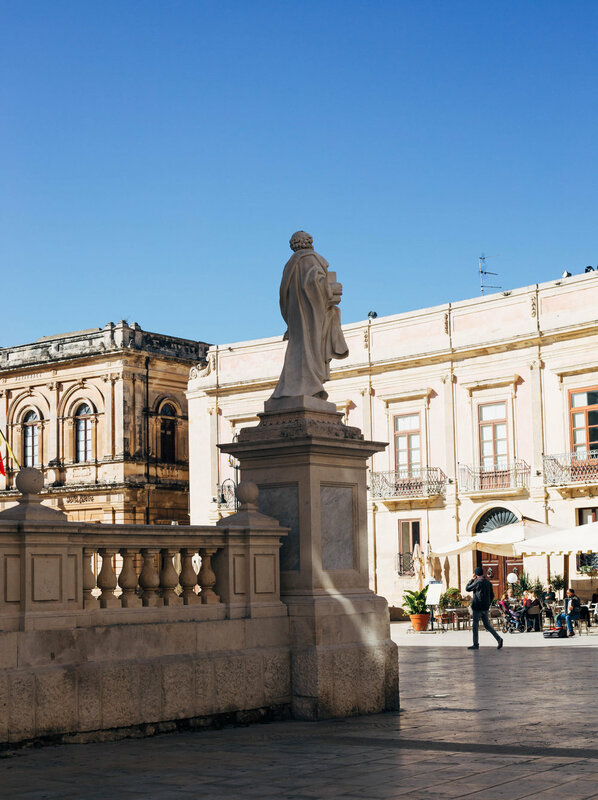 We started in Modica, made our way to (yet another!) artisan cheese maker: Giovanni Floridia, a producer of Cacio Cavallo cheese and farmer of the Razza Modicana cows. We made a quick stop in Noto for almond granita, then arrived in Catania where the focus was largely on the fish market, and preparing fish. Sidenote: I now know how to gut, clean and filet fish! We stayed in Mirto one night to experience a unique hotel called Albergo Museo Atelier Sul Mare that is part-museum-part-hotel with each room designed by a different artist. The tour of the rooms was equally as dazzling as it was hilarious. Our last leg of the trip included a fantastic (REALLY fantastic: top-5-meals-in-Sicily-fantastic) lunch at an unassuming, yet beautiful agriturismo called La Manna di Zabbra in Pollina, a quick visit to the salt flats in Trapani and a tour and tasting of Marsala IN Marsala at Cantine Florio. Whew! I also traveled for a bit after Cook The Farm (went to Malta, Rome and up to Finland! ), and added those photos to my portfolio! And that's a WRAP! Thank you so much for following along on this singular experience. If you are planning a trip to Sicily, or considering applying to Cook The Farm, need a good pasta recipe, or just want to know once and for all if it's arancini or arancine, feel free to reach out to me on Instagram, or by email me at: brineproject@gmail.com. 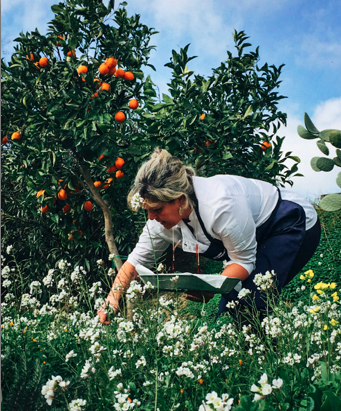 I recently returned from a ten-week food studies program called Cook The Farm at the Anna Tasca Lanza Cooking School in central Sicily, and wanted to post a recap of my experience, as best I can. Through tastings, lectures, and hands-on lessons in the kitchen and on the land, this program was all about bridging the gap between farming, cooking and eating. Each week was dedicated to an ingredient, for example: Wheat, Wine, Cheese, Citrus, Nuts & Seeds, etc. in addition to culinary anthropology and garden horticulture. Our home for the duration of the program was a convent (yup) in the center of a small town called Valledolmo, which we shared with three Sicilian nuns. The church bells chimed every hour and half hour, and at around 6pm each night, they played a short tune that was slightly out of key. I wish I recorded it, because it was weirdly comforting. There were many special moments in this experience, but I wanted to share a few of the ways that it felt especially meaningful. I've opted to bullet a number of thoughts, quotes, ideas, questions woven between some of the photos I took. It's neither chronological, nor an exhaustive list of everything I learned, saw, experienced. Feel free to hop around and read or view what you choose. Sicily is one of the most stunningly beautiful places I have ever seen-- it's Italian, but so different than any other part of Italy I've visited. 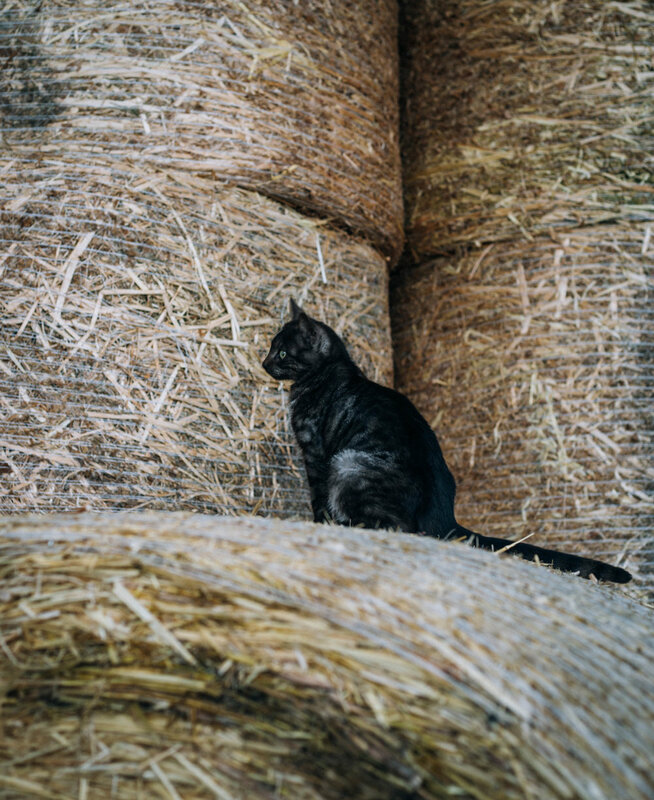 It has a rustic beauty, and old traditions are still very much alive. I'm grateful that I had the opportunity to visit many corners of the island, because over my ten weeks there, I really grew to love it. “Semina luce” in Italian translates to sowing light. This phrase was mentioned in one of our first lectures by Gea Galluzzi. Gea's talk focused on the great agrobiodiversity heritage of different wheat species and the challenges this genetic diversity has faced over time as industrialized agriculture and food systems develop. She emphasized that cereals are the foundation of agricultural society. And so began Wheat Week. "Tradition, in our idea, is something timeless, but the further we get from our relationship to food, the more we use the word 'traditional'." You must be your own compass for what is "good" or "bad." The series of photos below were taken at a local mill we visited not far from the town where we lived. It was encouraging to see these millers working with local wheat. Their flour is stone ground, so that the germ of the wheat is ground into the endosperm, spreading its oils and imparting both nutrients and flavor into the final product. We were lucky enough to taste their flour in the form of freshly baked cornetti. I came into this program thinking that I would walk away with answers, but as it turns out, I walked away with even more questions. One that I've been thinking about a lot: “How can small be sustainable? How can big be right?” This question was posed by Fabrizia Lanza, director of the School and founder of Cook The Farm. 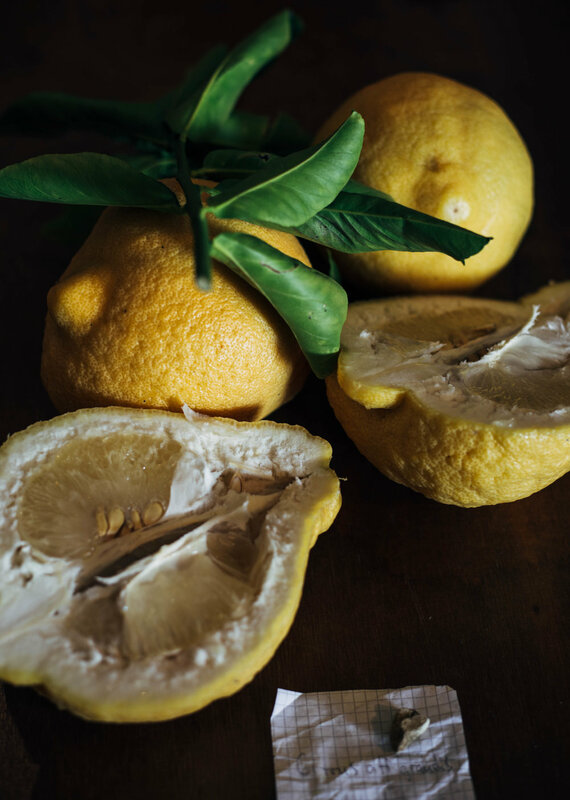 Fabrizia is a wealth of knowledge about all things food and wine, and deeply connected to the Sicilian landscape. "Ancient grains is an abused qualifier. Each grain has a personality, a color, a perfume." While she was “caulking” a bowl of couscous over a pot of boiling water (far left photo below) using a paste made out of flour and water, Bonnetta Dell-Oglio said, “You must be elastic. Never too heavy. This idea arrives slowly to the consciousness.” Bonnetta is a Sicilian chef and passionate advocate of organic agriculture and biodynamic wine production. I have a lifelong tendency to overthink everything, so the idea of letting go, or "being more elastic" not only in the kitchen, but also in my every day, felt freeing. 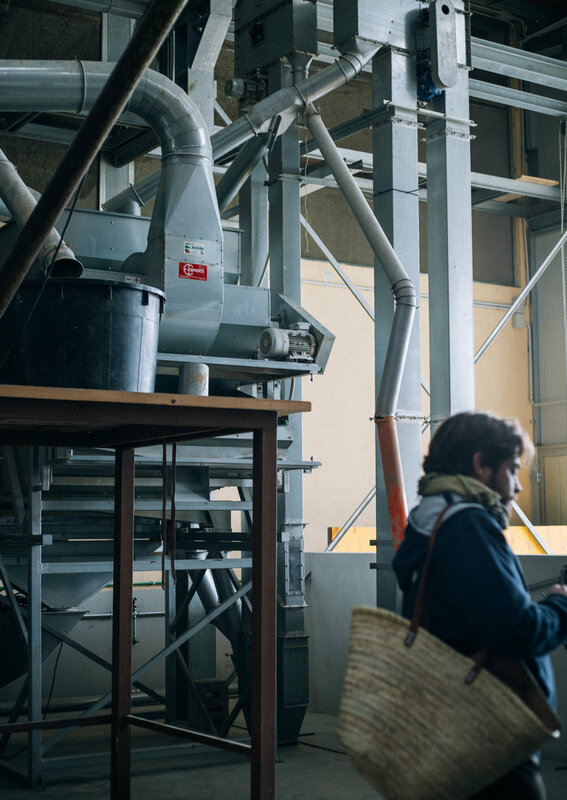 For many years, Bonetta has fought for the defense of Sicily’s ancient grains (she also said the quote above), which have been cultivated on the island for over 8,000 years. I like every step of bread making. I like sprinkling flour across a counter, I like seeing dough after it's risen, I love punching it down, kneading, shaping, I love the yeasty smell and the smooth texture. Bread is beautiful, and so culturally charged! Bread is a staple in the Sicilian diet as well as many other countries around the world. I spent a lot of time thinking about how the US has a history of demonizing one food category at a time, which plays a huge role in our complicated relationship to food and tradition. Changing where you shop and/or how you eat has to be a fundamental change in values. And change is ALWAYS tough, but it's possible. We made all this bread! 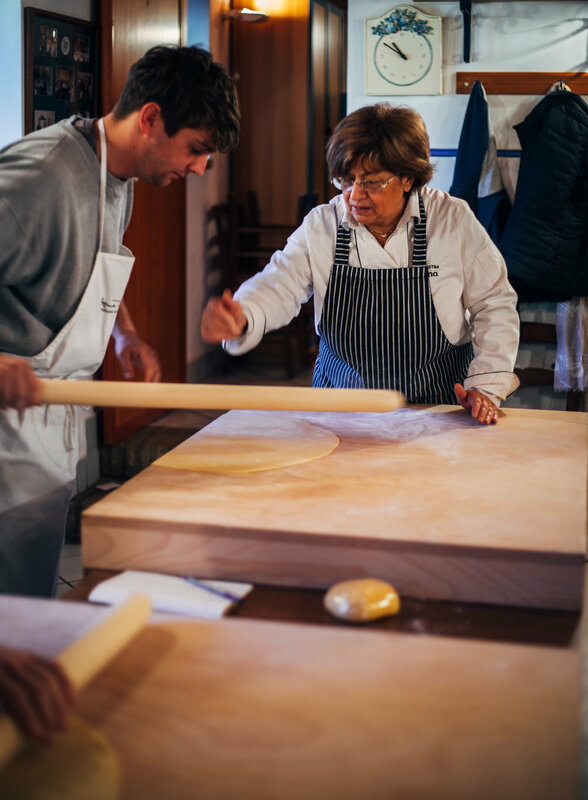 Rina Poletti came from Emilia-Romagna with her giant rolling pins, and taught us how to make traditional sfoglia: a sheet of pasta dough to make ribbons of pasta or stuffed pasta. 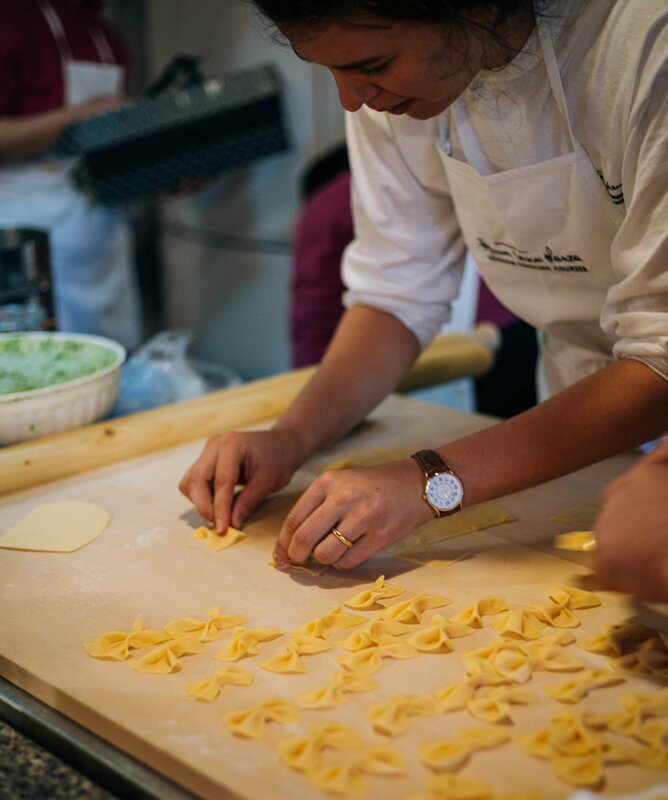 In Italy, pasta is often made by hands with fresh eggs and flour. 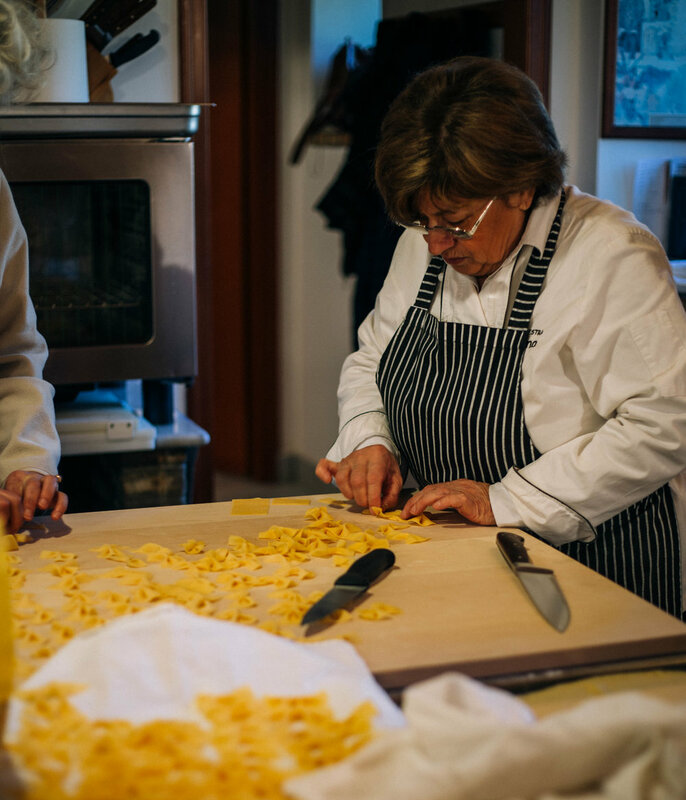 Rina emphasized that making sfoglia requires FEELING it with your hands. The recipe changes according to you and your body, your body temperature and how you move your hands. Even though we didn't speak the same language, it was obvious that Rina is one of those shiny, deeply good people, a phenomenal teacher, and generous with her knowledge. 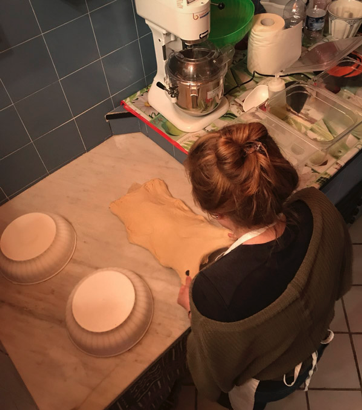 I'll never forget her walking around the room while we made our first attempts at sfoglia, and showing us the crucial ranare ("frogging") motion that looked like a swift swimming motion across the length of the rolling pin. Rina recently started a non-profit called Missione Mattarello (Mission Rolling Pin) to help those affected by earthquakes in Italy. "Smell is the sense that is least understood." "When tasting food or wine, environment matters. Both your internal environment (ie hormones, mood, what you have been consuming throughout the day, which in turn, affect your saliva make up) AND external environment: temperature, noises, aromas." Nikki Welch gave me a lot to think about in her Physiology Of Taste lecture (see her quotes above), but “Open yourself to being curious” was something I thought (and now think) about frequently. Nikki was talking about flavor when she said this, but I think the same sentiment rings true for new experiences, or traveling, or even the mundane moments of everyday life. It's incredibly difficult to step outside of what we know, or what we believe ourselves to be good at. Staying curious seems obvious, but it's a necessary reminder. Nikki is a UK-based wine and flavor specialist. The combination of her passion, work and experience in wine led her to the creation of the WineTubeMap, a visual way of exploring wine, organized by flavor. Nikki was wonderfully inspiring and energetic and made me want to delve further into smell science. Below: 56(!) 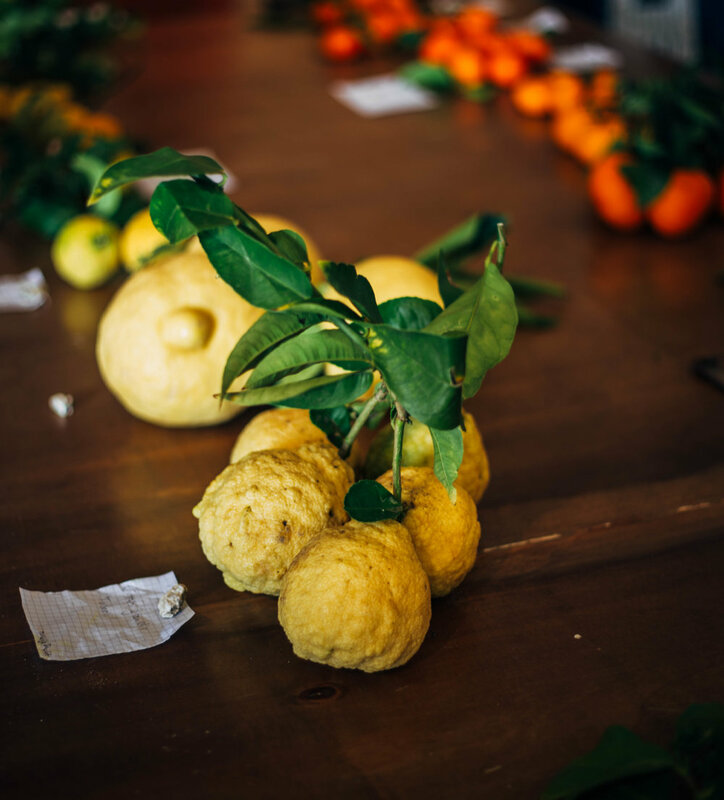 varieties of citrus fruits gathered from Palermo, and spread across a table at the start of Citrus Week. 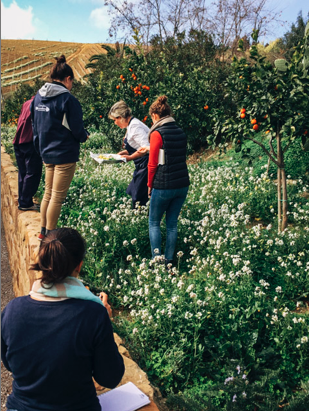 We learned about when these plants arrived in Sicily, the different mutations, textures, flavors and colors. The town of Valledolmo was delightfully quaint, but on weekends, it felt necessary to escape and see other parts of the island. Below is a series of photos from Scala Dei Turchi (The Turkish Steps) in Realmonte, followed by photos in and around its neighbor city, Agrigento, on the Southern coast of Sicily. The steps are an impressive natural limestone rock formation, and they turned out to be an unexpected highlight of this weekend trip. 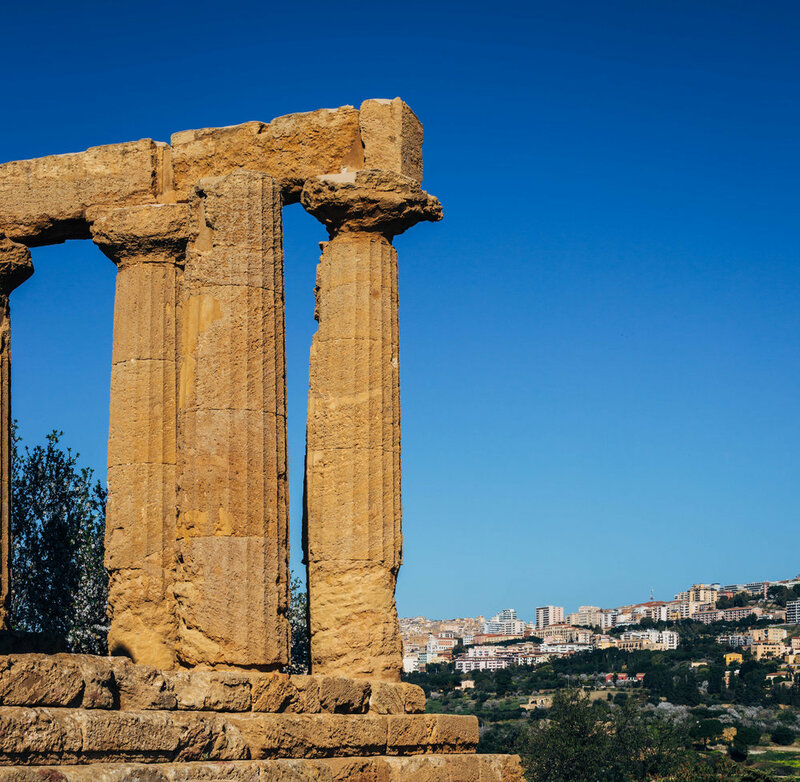 Agrigento is probably most known for its Vallei Dei Templi and Garden of Kolymbetra. Founded around 580 BC, this hilltop city was once a grand city of the Mediterranean, and Valley of the Temples is now an UNESCO world heritage site. 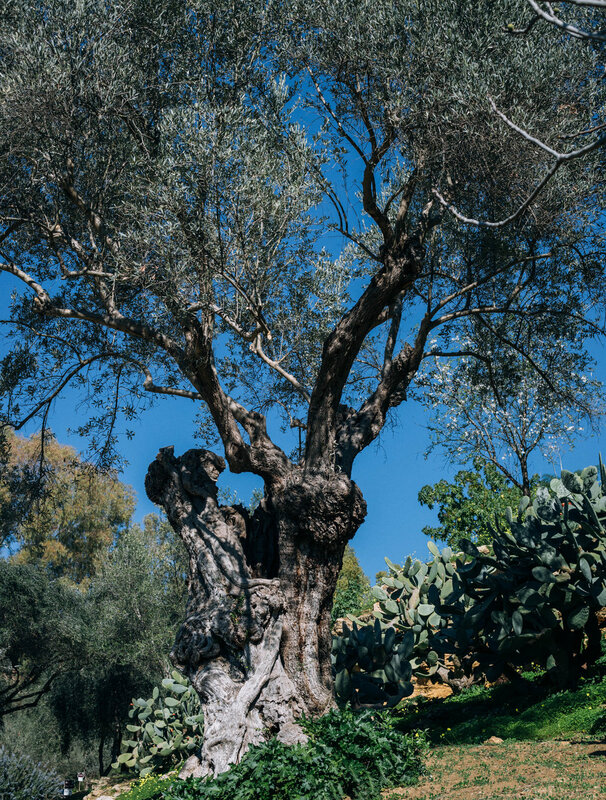 The Kolymbetra Garden is a fascinating example of the plants and trees that flourish in the Mediterranean: mostly citrus, but also pistachio, olive, carob and pomegranate trees that still grow because of the ancient water network. 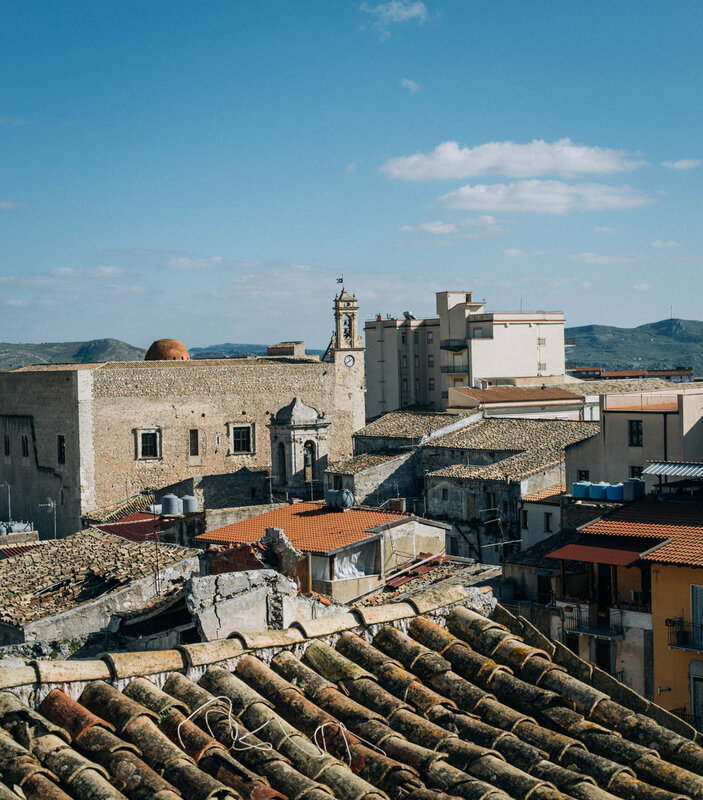 Not far from Agrigento, Favara was an impoverished and nearly abandoned city until local resident, Andrea Bartoli, decided to buy some of the empty buildings and convert them into a contemporary art space in the historic center. The area has an adult playground feel to it, and now includes a school of architecture for children, a bookshop, a tea garden, a sandwich shop, a bar and more. Buildings are covered with art inside and out, and the project became known as the Farm Cultural Park. Since its opening in 2010, the Farm Cultural Park has not only attracted tourists and artists from across the globe, but also created more jobs for local people. The park is colorful, eclectic and cool-- it feels like you're stumbling across one of Sicily's best-kept secrets. There's also a noteworthy almond museum in Favara, where there are over 200 varieties of almonds as part of the permanent collection. Watching a lamb being butchered was a challenge for me on many levels, but the toughest part was the accompanying sounds: the skinning, the slicing, the sharp cracking of the limbs and neck. The butcher was quick, clean and respectful, and butchered two lambs in only a few hours, but I couldn't help thinking that I might not eat meat if it were up to me to slaughter and butcher an animal. 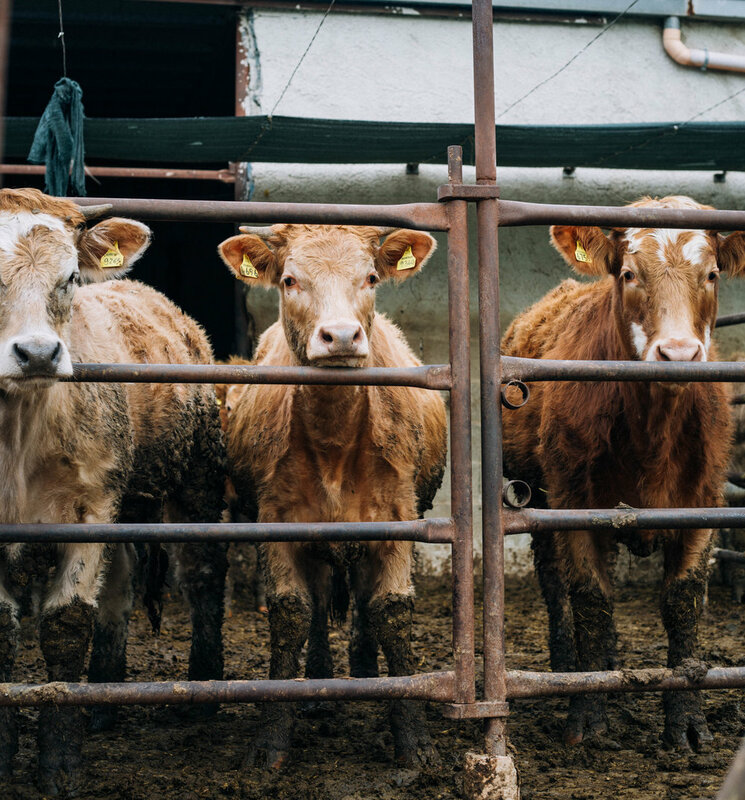 It's remarkably easy to buy meat in a grocery store, neatly wrapped in plastic, but I think that's distanced our connection to this process, and the animal. Though I don't think I will ever eliminate meat entirely from my diet, I'm more aware of the process and take pause to consider what exactly I'm buying and who I'm supporting. I liked the drama of the all smoke, plus, I was told the sandwiches were top-ten-best-sandwiches-ever quality. Cheese only involves THREE ingredients: milk, rennet (an enzyme contained in the stomach of ruminant animals, although there are some vegetable rennet options now!) and salt. We went to a number of cheesemakers on this trip! The series below features Filippo Privitera of Caseificio Privitera. Filippo specializes in pecorino (one of the world's great cheeses) and ricotta (which actually translates to "re-cooked" and is made by using the whey that runs off from making the large wheels of pecorino). Each morning, the sheep are hand-milked; the pecorino is made immediately, followed by the ricotta. The ricotta "groupies" (some local men who are very fond of cheese) roll up around 10am with bread or pastries or wine to pair with warm ricotta at the same exact moment that it's ready to eat. They talk (argue?) about cheese and eat snacks. Then the sheep go out to pasture for the remainder of the afternoon, before they are milked again in the evening. We shadowed one of the shepards, and went out to pasture with him and the sheep. He slowly guided them around for hours using a variety of different whistles that he has come up with over the years to communicate with them. We also saw the stretch-curd cheesemaking process at a separate facility near Valledolmo. Here, they're preparing the fresh curds in hot water to help give the cheese its structure, then stretching, and tying off the hunks of mozzarella. *Not pictured: countless other un-photogenic-yet-amazing moments. If you made it all the way here, THANK YOU! There will also be a (much shorter) Part II coming in two weeks! More Brine Project interviews coming shortly, but I wanted to share a few photos from my recent visit to New York City. Farmers Markets are one of my favorite places to take photos, and the variety of produce, grains, flowers, fish, dairy, meat, etc. at the Union Square Green Market this weekend was astounding, and beautiful! Enjoy. Exciting interviews and photos will be going up soon covering makers in two intriguing categories: coffee and chocolate.... Until next time!